On my previous entry I spoke about Upper Cross Syndrome (UCS). Check out "Dangers of a Desk Job Part 1" to learn more about UCS. This entry will explain Lower Cross Syndrome (LCS). LCS is acquired by maintaining a flexed position, such as sitting at a desk, for hours a day over several years that leads to muscle imbalances. 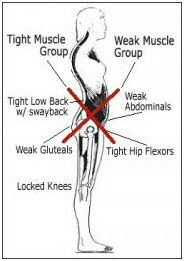 The muscle imbalances can cause pain and dysfunction in your low back, hips and knees. This is an adaptive posture often seen in corporate America and students. LCS is characterized by tightened and shortened iliopsoas, rectus femoris, erector spinae group: thoracolumbar, lumbosacral L5-S1, quadratus lumborum, TFL/iliotibial band, hip adductors, hamstrings, piriformis and gastrocnemius muscles; weakened and lengthened abdominal group, gluteus medius, gluteus maximus, vastus medialis oblique, tibialis anterior and plantar fascia. The muscle imbalances cause the hips, knees and ankles to move incorrectly and can lead to chronic pain and instability. The imbalances also cause the joints in the low back to move improperly and shift out of their proper alignment. The misaligned or subluxated joints in the low back put pressure on your nervous system and can lead to many problems down the road; from low back pain, constipation, cramping to degenerative disc disease and problems conceiving. It is important to visit your chiropractor to check for muscle imbalances that may be causing spinal subluxations affecting your nervous system.